Vine Street Christian Church will host a coffeehouse on Friday, Sept. 18 to benefit its Vine Street Living Waters clean water ministry. 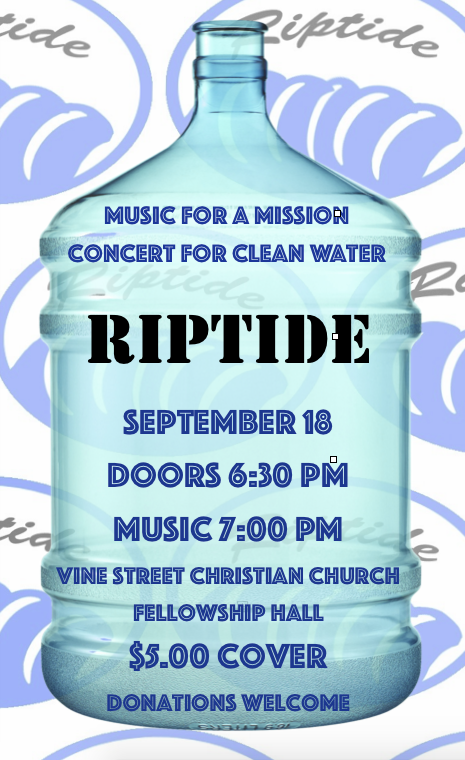 Headlining the musical event will be local alt-pop rock group Riptide, featuring Vine Street's Crawford Lyons. Doors open at 6:30 p.m. and music begins at 7 p.m. There is a $5 cover charge. Desserts will be available to purchase. Additional donations will help to fund clean water projects regionally and internationally. More than a billion people around the world don’t have access to pure water. Vine Street Living Waters aims to address that need by partnering with communities to build low tech, highly-effective water purification systems. Team members have traveled to Peru to pitch in on projects in that country. Recently, Vine Street Living Waters partnered with a Tennessee couple to install a clean water system in nearby Macon County. This mission work is in partnership with Living Waters for the World (LWW), a ministry of the Presbyterian Church, USA based in Spring Hill Tenn., and Westminster Presbyterian Church of Nashville. We can never take clean water for granted. There's a coffee mug, Bongo Java coffee and a great show waiting for you. Come on out Sept. 18!